Why Choose Indiana for Online Higher Education? Data collected by the Georgetown Center on Education and Workforce indicates that postsecondary education is an important factor in employment outcomes. In fact, 34% of employers look for candidates with at least some college or vocational school experience, while 20% require a bachelor’s degree. Still, at least 8% of employers seek applicants who hold advanced degrees in their field, and the Bureau of Labor Statistics projects that some of the fastest growing occupations require postsecondary education. Therefore, students should consider college programs in Indiana, which can lead to more employment opportunities. This page includes information and resources regarding affordable online universities in Indiana for both residents and out-of-state students. To ensure the best return on investment, students must consider multiple factors when selecting an online program. Our selection considers the scope of distance programs, student-teacher ratios, student resources, and job availability for graduates. However, this ranking places particular emphasis on affordability, which includes average financial aid awards, the percentage of students who receive scholarships from their school, and average tuition for full-time students. Aspiring Indiana college students can find detailed information in the list below. Indiana Wesleyan University has an evangelical Christian perspective at its foundation. The first classes held at the university date back to 1920. The school's 350-acre main campus is located Marion, Indiana. More than 80 undergraduate degrees and 36 graduate degrees in fields like business, accounting and healthcare administration and doctorate level classes in ministry and organizational leadership are awarded at Indiana Wesleyan University. Student numbers at the best online college in Indiana top 10,000 when the online students are included with the on-campus and international student populations. Online classes are kept small and the school assigns online students an academic advisor who partners with adult learners to communicate important messages to department administrators and ensure that students remain on track to graduate on time. Aim of instruction at Huntington University is to prepare adults for Christ service. Evidence of this is the requirement that students complete 30 semester credits of spiritual formation which includes attending prayer meetings. Student to faculty ratios are small at campus and online classes. Average student to faculty ratios are 13-to-1. Fully online, hybrid and early entry high school virtual classes make up the school's online platform. Discounted virtual summer classes reduce the time it takes to graduate which is why Huntington University is a best online college in Indiana. For adults interested in taking classes on campus, undergraduate and graduate degrees are available at the Huntington, Indiana and Peoria, Arizona locations. Fort Wayne, Indiana is the site of the University of Saint Francis-Fort Wayne campus. About 2,300 students attend this Midwestern Catholic school that sponsors 400 student events and 40 student clubs and organizations. Virtual classes are delivered completely online, and Edge and Canvas are two major delivery systems. At the best online college in Indiana, the same instructors teach on-campus classes and virtual classes in in subjects like accounting, communication, education and ministry. Among the undergraduate and graduate online degrees, the Master of Business Administration and the nursing degree are widely recognized distance learning degrees. For students with some credits from other schools, transfer credits are accepted at the University of Saint Francis-Fort Wayne. Indiana State University is one of the Hoosier state's postsecondary schools with a large and diverse student population. Located near Illinois' western border, the university introduces students to other parts of the world through its study abroad program. The best online college in Indiana has over 60 online programs and most are completely virtual. Minimal on campus class participation is required while enrolled in virtual programs that are not fully online. At Indiana State University, online programs start at the diploma level and move up to the doctorate degree level. Verifying that campus or online programs are available is part of the registration process. MyISU is the doorway into the virtual campus. Ball State University is about a one-hour drive from Indianapolis, Indiana. The university is located in Muncie, Indiana, a small town of less than 75,000 residents. Undergraduate, graduate, international and online education are four admissions options at the school. The best online college in Indiana offers more than 70 fully online degree programs. Certificates can be earned in less than a year. Ball State University also offers courses that fulfill licensing requirements for teachers. Study areas include early childhood education, criminal justice, nursing and supply chain management. There is also an option for students taking classes on campus to get on a graduation fast track by enrolling in online summer courses. Grace College and Theological Seminary puts on campus students in a small-town environment. About 5,000 people live in Winona Lake, Indiana, the city where the seminary is located. This best online school in Indiana offers an associate degree and an accelerated bachelor’s degree program. Grace College School of Professional and Online Education administers the school's virtual programs. Bachelor’s degree completion majors for transfer and first-time students are in quality management, human services, management and business administration. The associate degree online option aims to prepare students for bachelor’s degree completion. Class Access is the login portal at Grace College and Theological Seminary for students taking undergraduate and master's degree classes. Indiana University-Bloomington is one of the state's larger core campuses. Basketball, particularly at the Bloomington site, introduced many people to the university. As part of the state school's nine campuses, the Bloomington school offers more than 200 undergraduate majors. More than 200 research centers and institutes, through programs like IU Stars, put students in direct contact with scientists, research professors and natural sciences experts. Hybrid and fully off campus degree programs are available at the best online university in Indiana. These 120 plus distance education programs provide deeper learning in areas like computing and technology, humanities, health sciences, informatics, education and social work. Indiana University-Bloomington administers its virtual campus through its Office of Online Education. Purdue University-Main Campus liberal arts college administers an early degree program that permits students to graduate with a bachelor's degree in three years. Intent to declare a three-year graduation must be submitted to the school by the end of the freshman year. Purdue has three regional campuses, one in Fort Wayne, another in northwest Indiana and the third in Indianapolis. Thirteen colleges make up the best online university in Indiana. Agriculture, education, exploratory studies, liberal arts and pharmacy are among those colleges. OneCampus is the portal through which students and instructors share files and review personal records. Blackboard and MyPurdue store class assignments, exams, recorded videos and study materials for students enrolled in online courses at Purdue University-Main Campus. Student to instructor ratio at Oakland City University is small, generally kept at about 12-to-1. Schools that courses are taught in are arts and sciences, business, education, religious studies, adults and professional studies and online degrees. Undergraduate online degrees lead to associate and bachelor's credentials. There are more than 47 degree majors at this best online college in Indiana. Online graduate degrees and certificates are in business administration, strategic management and education. Oakland City University is a Christian university that encourages faith and service. Off campus learning for students who prefer to learn in a face-to-face setting takes place at the school's five extended learning centers. Annually Indiana University-Purdue University-Indianapolis awards more than 1,500 degrees. Eighteen schools, including life sciences, liberal arts, engineering and health sciences, are divisions that the degrees are awarded in. Students who prefer big city life can live and learn in Indiana's largest city while they attend Indiana University-Purdue University-Indianapolis. Several professional sports team compete in Indianapolis. Canvas, AskIU, One.IU, IMail and UMail are resources that connect online students, their peers and instructors. Knowledge Base puts students in touch with technology support 24/7. This best online college in Indiana has been educating undergraduates for more than 100 years. In addition to 100 plus degrees, the school grants undergraduate and graduate certificates. Evansville, Indiana borders the Ohio River. It is home to historic Native American sites, the Mesker Park Zoo and the University of Southern Indiana. The school's campus spreads across 1,400 acres. This Division II best online university in Indiana is comprised of four colleges. More than 100 academic fields are taught within the four colleges. Certificates, bachelor's, master's and doctoral degrees are granted within the University of Southern Indiana's online learning division. Delivery of online classes ranges from fully online to hybrid or blended. The course search engine assists students with finding campus and online courses that keep them on track with meeting their graduation plan requirements. Indiana University-Purdue University-Fort Wayne is 18 miles from Ohio and less than 60 miles from Michigan. Transfer, international, local, domestic and online students sign up for classes at the school. myIPFW is the system that campus and online students log into to register for classes. Credits are granted for eligible experiential learning. Four bachelor's majors and seven minors are available within the online division of Indiana University-Purdue University-Fort Wayne. The small business development and supervisory leadership certificates are hybrid programs. Of all the virtual systems at the best online university in Indiana, Blackboard is accessed the most. Indiana College Network, a virtual library and proctored exams are other online resources. Indiana University-East is situated in the Midwestern town of Richmond, home of the Starr-Gennett Walk of Fame and historic depot district. Certificates, diplomas and degrees earned at the best online school in Indiana are equal to degrees and credentials earned at Indiana University's main campus. Composition studies, math and early childhood education are the three graduate certificates online students can earn. Online bachelor's degrees span across 14 disciplines, including nursing, political science, informatics and business administration. Indiana University-East is accredited by the Higher Learning Commission and part of the Online Learning Consortium. Students who excel may qualify to participate in the honors program. Purdue University-Calumet Campus is a diversely populated school located near Chicago. About 12,000 students attend the university, enrolling in one or more of the school's 70 study programs. Diverse learning is direct through classroom and online education. It is also indirect as students engage with and learn from peers from 33 states and 45 countries. Nursing is a recognized program at the best online college in Indiana. There is the online RN to BSN program which focuses on nursing leadership and the professional nursing pathways program. Both programs lead to a bachelor's degree. To succeed at Purdue University-Calumet Campus, students should commit up to four hours a week for each credit hour course they take. Indiana Institute of Technology grants career focused degrees at the associate, bachelor's, master's and doctoral levels. Degree programs include business, technology, organizational leadership, human resources, criminal justice and digital graphics. Programs like global leadership require students to complete a residency. A large majority of campus-based courses can also be taken fully online. The best online college in Indiana school's Discovery Track is designed for students who are not sure which major they want to declare. Two semesters is the maximum time that students can remain on the Discovery Track. Virtual tours introduce prospective students to campus facilities, resident life, business offices and academic buildings at Indiana Institute of Technology. The main campus of Trine University is located in Angola, Indiana, a city in the Northeastern part of Indiana. More learning prospects at the school are available through Trine University-Regional/Non-Traditional Campuses. The 130-year school's main campus sprawls across 450 acres. Class sizes top at about 19 students. Total annual enrollment at Trine University-Regional/Non-Traditional Campuses is slightly above 5,000. Distance education degrees are granted through the College of Graduate and Professional Studies. 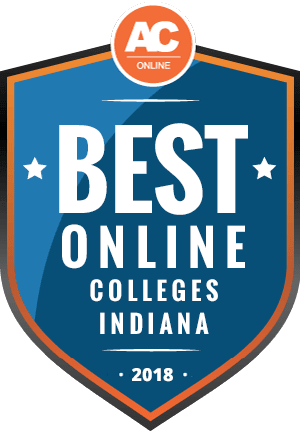 Business administration, applied management, engineering management and physical therapy are part of the best online school in Indiana virtual campus. These degrees start at the two-year associate level and peak at the doctoral level. Moodle, WebMail, MyPortal and Innovation One are tools that students and instructors rely on. Ottawa University-Jeffersonville is part of a multi-campus learning environment. The Clark County, Indiana school is located near the Ohio River. Online programs are offered in business, education and arts and sciences. Lectures and course materials are available 24/7 for online majors. MyOttawa is the login portal through which students taking online classes gain access to Blackboard, campus email, MyPass and the online Gangwish Library. The Christian based school also has a faith and church vitality login portal that connects students via prayer and faith-based chat. Academic categories are business, education and arts and sciences. Lectures and course materials are available 24/7 for online majors. Advisors at Ottawa University-Jeffersonville meet with students to map out graduation plans and offer support as needed. This best online school in Indiana offers a sample online class that prospects can view and get a firsthand feel for how online learning at the school works. Higher education institutions in Indiana strive to recognize the diverse needs of their student population. The state serves a variety of learners, including single parents, professionals with full-time jobs, and underserved populations. Therefore, while on-campus enrollment remains prevalent, students can also choose from accredited and affordable online universities in Indiana that provide an equal education as their on-site counterparts. The table below indicates that over 32,000 students attend one of 108 Indiana programs offering coursework completely online. Students who choose to attend schools in their state of residence typically pay less than those from out of state. For instance, the data below reveals that out-of-state students attending four-year public institutions in Indiana often pay over $9,600 more than residents. Meanwhile, out-of-state students attending two-year public schools pay nearly $4,000 more than residents. Online programs offered at brick-and-mortar schools may apply out-of-state tuition rates, while 100% online schools often offer a flat rate for all students. Additionally, some programs maintain regional exchange agreements with other states that reduce tuition rates. Students can also establish residency within 12 months to qualify for in-state tuition. Current in-state tuition throughout Indiana nearly mirrors the national average at four-year institutions, while out-of-state fees exceed the national average by almost $4,000. Indiana currently provides distance education to over 12,000 nonresident students enrolled in bachelor’s and master’s degree programs. While some universities charge out-of-state tuition, students should check to see if their home state qualifies for reduced rates. Indiana participates in both regional and individual state reciprocity agreements. However, details vary, so students need to visit the Indiana Commission for Higher Education website to identify specific requirements. Indiana belongs to the Midwestern Higher Education Compact (MHEC), an organization that manages reciprocity agreements between multiple states. Through the MHEC, public and nonprofit schools charge out-of-state students no more than 150% of what residents pay, while private schools reduce fees by 10%. Therefore, the amount of savings varies from school to school, but between 2017-2018, Indiana reported that their students saved about $5,987,890 collectively. MHEC member states include Illinois, Indiana, Iowa, Kansas, Michigan, Minnesota, Missouri, Nebraska, North Dakota, and Wisconsin. While the MHEC recognizes all public, private, and nonprofit schools in each state, students should note that schools retain the right to limit participation. The State Authorization Reciprocity Agreement (SARA) strives to make education more accessible to students. Furthermore, schools affiliated with SARA have more uniform standards and allow students to avoid unnecessary tuition costs. While a state may hold active membership, schools can choose not to participate. Over 50 schools in Indiana hold SARA approval. Students should also note that SARA covers individual classes as well as entire programs. Therefore, students may need to verify that their program has full coverage. The section below contains commonly asked questions regarding online education in Indiana. While we offer a cursory view of Indiana’s online programs, make sure to explore the details of any specific schools of interest. Do Online Credits Cost More or Less in Indiana? The cost of online tuition varies from school to school as each institution identifies their own rates based on their specific courses and components. Therefore, students should outline basic the traits of their ideal program. For instance, if students wish to attend private institutions, they should anticipate higher tuition than rates at a public or nonprofit university. Online students do not need to factor expenses such as housing, meal plans, or commute costs when into their overall tuition rates, which makes distance learning more affordable in the long run. However, online schools often embed technology fees to pay for their learning management system and other software required for distance learning courses. Affordable online programs in Indiana may not maintain a physical location, which can often lower tuition rates. However, as online learning continues to grow in popularity, inexpensive programs often emerge that may lack credibility. Students should only consider programs that hold a valid regional or national accreditation. Which Indiana Schools Accept the Most Transfer Credits? Residents of states affiliated with MHEC or SARA may transfer their credits by sending their official transcripts to the school’s registrar’s office, as long as they meet the school’s standards and GPA requirements. Similarly, Indiana schools often welcome students applying from schools that hold regional accreditation. Coursework from nationally accredited programs may only transfer to other nationally accredited schools. In general, schools accept a maximum of 60 credits from two-year institutions, while some accept up to 90 credits from four-year schools. Some programs encourage students to transfer by streamlining the application process, including Ivy Tech Community College, which offers over 100 transfer programs for resident and out-of-state students. The Indiana Commission for Higher Education provides detailed information about coursework accepted by colleges and universities in Indiana on their website. Indiana offers their Statewide Transfer General Education Core program, which ensures that 30 hours of general education credits can transfer between public colleges and universities. Students must also hold a 2.0 GPA or higher to qualify. Make sure to browse the Core Transfer Library to identify commonly accepted courses and the universities currently participating in the program. Will Any Online Colleges in Indiana Accept a GED? According to the General Educational Development (GED) Testing Service, 98% of colleges and universities accept the GED as a valid credential. For instance, Purdue University Global accepts students with a GED or state equivalency certificate, and data provided by the American Council on Education states that over 18 million people have earned a GED since the exam emerged during the 1940s, while 800,000 took the exam last year alone. The GED exam assesses language arts, reading, writing, mathematics, science, and social studies. This test must have a proctor and applicants cannot complete the exam online. The exam possesses the same rigor as a high school diploma, and GED Testing Service data indicates that only 60% of graduating high school seniors could pass the test on their first attempt. The GED also partners with Canadian provinces. While 145 remains the standard passing score, states can raise the base standard if they choose. How many academic terms per year do online colleges in Indiana offer? Traditionally, colleges and universities offer limited enrollment dates, as the screening process requires much time and effort from the admission department. Additionally, many schools feel that limited start dates encourage selectivity, increasing opportunities to admit only the best candidates. However, many schools have adopted an inclusive model to accommodate as many students as possible, and the best online programs in Indiana offer multiple enrollment periods to assist underserved populations, such as students with disabilities or learners working full time. Some students struggle to achieve acceptable test scores on the SAT and ACT. Therefore, flexible start dates avoid penalizing struggling applicants who want to earn a degree. In Indiana, the University of Southern Indiana and Marian University offer start dates throughout the year for both resident and out-of-state students who have a high school diploma or GED, while students enrolling into a graduate program must hold a bachelor’s degree from an accredited university. Purdue University Global allows students to start at the beginning of each month. Students must complete an informational interview, show proof of completion from a U.S. secondary school, and pass a criminal background check. Graduate students applying to Purdue Global should possess at least a 2.5 GPA from an accredited school and pass a background check, as well. Which Online Colleges Will Accept FAFSA in Indiana? Federal Student Aid strives to ease financial students’ financial burden, no matter their preferred learning environment. To qualify for the Free Application for Federal Student Aid (FAFSA), students should only consider online programs that hold a valid regional or national accreditation and note that enrollment status significantly impacts the amount of assistance awarded. Typically, part-time students only receive half of what full-time learners receive. FAFSA offers both unsubsidized and subsidized Stafford loans, Perkins loans, grants, and work-study programs. Online schools often do not provide work-study, as many students do not live locally or the school does not have a physical location. Universities often choose work-study placements goals to help students gain experience while earning income, but many staff members teach from inconvenient locations, making in-person collaboration unlikely. However, some schools might offer work-study placements that would allow students and mentors to work remotely. Are There Any Free Online Classes I Can Take From Indiana Colleges? At Indiana University Online, students receive access to three online courses. Big data applications and analytics covers the value of using the cloud to operate data analytics, which can lead to solutions in the field. Students explore current case studies including the recommender systems at Netflix and genomic data. As digital learning continues to grow, future educators need to understand how to engage with students. This course considers the backward design process, active learning, visual design, online presence, and multimedia. Students can also enroll in information visualization, which counts toward an online data science degree. This course introduces students to the process of effective visualization and explores data analysis algorithms to uncover trends to foster research and development. Students may also want to consider some of Indiana’s local community colleges for free classes. At Ivy Tech Community College, learners can enroll in introduction to design technology, where they explore the appropriate integration of design thinking with cutting-edge technology. Students also explore the history of design technology, consider structural logic, and sustainable components of design technology. How Can I Find the Online Program Options at Indiana’s Colleges? The Indiana Department of Education strives to create understandable pathways to success for students at any level. Through the Learn More Indiana website, students can explore what type of universities exist in the state. Students can also uncover the schools that suit their needs most by choosing what degree they wish to earn, level enrollment status, geographic location within the state, school type, school size, and learning environment. Learn More Indiana also helps students prepare critical materials needed for successful college admittance. Furthermore, Indiana provides access to application waivers for students with financial needs. The site also helps students consider their career objectives to find the most suitable programs in Indiana. Learners receive access to personality tests, career path maps, and ScholarTrack, a system that provides access to students’ financial resource needs. While students often worry about how to fund their education, many learners qualify for financial aid. Pell Grants cover a large portion of tuition and require no repayment. Students earning an advanced degree or do not qualify for grants should explore the scholarships listed below. The 21st Century Scholarship aims to remove the financial burden of attending school for qualified students. Additionally, awarded students also gain access to a personal success coach. Students enrolling into undergraduate programs at public universities in Indiana may apply. Candidates enrolling into private institutions receive public school rate coverage. Students earning a degree in the law enforcement field may qualify for this scholarship. Applicants must submit proof of good academic standing, maintain full-time enrollment and Indiana residency, and submit a brief essay about their professional goals. Students may renew this scholarship for a maximum of three years. Students should have. INDOT provides scholarships to engineering students who wish to develop Indiana’s infrastructure. Students may apply as an undergraduate or graduate student. Undergraduate students may renew this scholarship for up to five years, while graduate students can renew twice. Students also receive access to paid summer internships and preferential job placement. This scholarship seeks to improve educational achievement in Indiana. Each year, four students enrolling into public or private universities in Indiana receive full-tuition scholarships. Learners majoring in community development, education, religion, or philanthropy receive preference. Additionally, students receive $900 each year for books and other related equipment. African-American and Hispanic students who plan to teach in Indiana schools may apply for this scholarship. Students must commit to teaching in Indiana for three years at minimum and may reapply each year if they maintain a 2.0 GPA. Applicants should possess Indiana residency and maintain full-time enrollment.